Balsam Technologies is driven by technical rigor, integrity, a commitment to listening, and high-quality services. 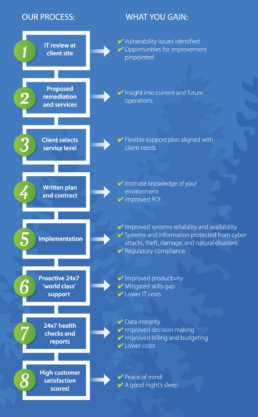 These factors, combined with our proactive approach to managed IT services, give you critical insight into the health and performance of your IT environment while protecting your data and systems. This will empower you to make informed strategic IT decisions, maximize your IT resources, increase productivity, improve operational efficiencies, and provide better services to your customers — internal or external — while lowering your costs. Pricing is simple and straightforward. Although your plan is customized, you can choose from several packages with base solutions that simplify your selection process. 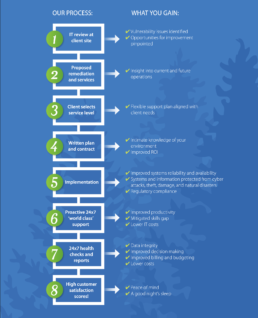 These steps show how we make sure you receive the very best managed IT service experience, along with the resulting benefits that accrue to your organization.